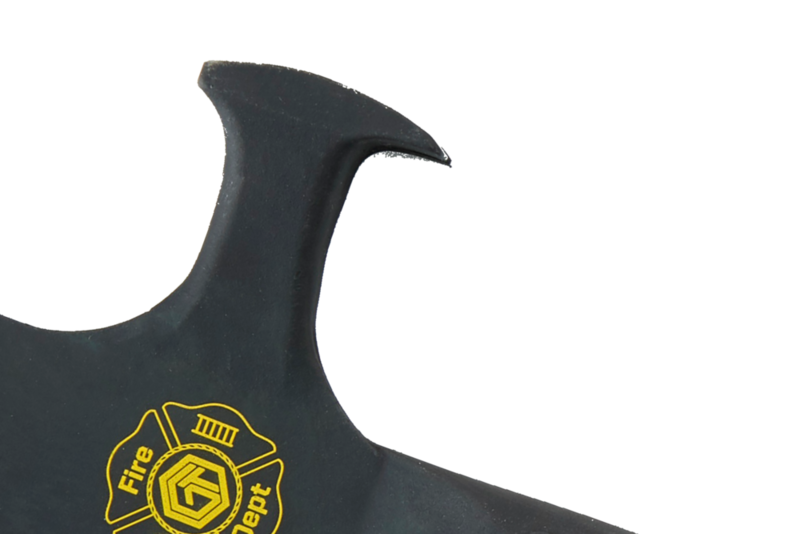 The HRT (Handy Rescue Tool) from Off Grid Tools is a reliable and versatile yet lightweight tool, intended to bridge that gap between small pocket-sized tools and large heavy ones used in today's fire service. Backed by a Lifetime Warranty, this made-in-the-USA product meets all 4 categories of a fire department forcible entry tool. The HRT includes an axe (fully resharpenable), hammer, nail puller, hose spanner, pry bar, gas cut-off wrench, grapple hook, NUPLA® fiberglass handle with shock absorbing powergrip™, cast 1055 carbon steel blade and shank with a rust-resistant matte finish. Hardened 1055 carbon steel tang will hold a sharp edge, while being strong enough for serious demolition. The HRT comes with a power grip handle to minimize shock and vibration. The hammer head and claw on the back side of the axe head is designed for use on the job site or for any sort of demolition. The gas valve cut-ff wrench allows you to safely turn off the service gas lines.